Fragrant Meyer Lemons make the best lemon curd. 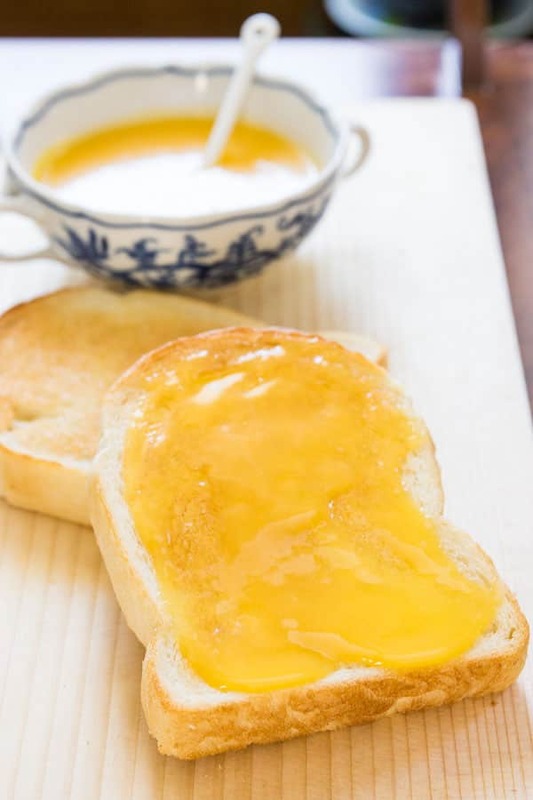 This easy lemon curd recipe only takes ten minutes to make. 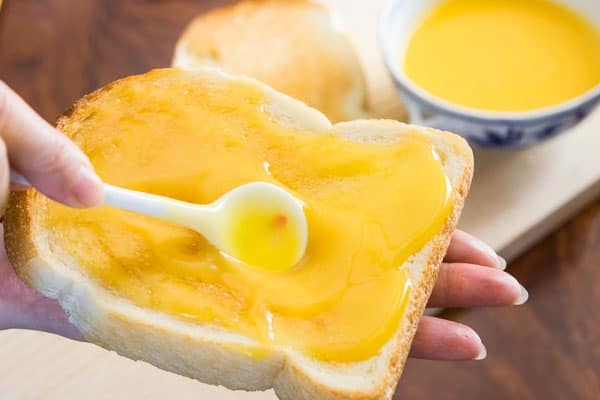 Lemon Curd is a delicious sweet and tangy custard that makes for a great condiment for toast, pancakes and desserts. My easy take on this classic comes together in minutes and steps up the flavor by using Meyer Lemons. I’m chronically impatient and unrepentantly lazy. Whether I’m navigating a city’s streets or planning a meal, I’m always seeking the quickest, easiest route. It’s not one of my best traits, but it has a tendency to make me more efficient. If a dish has too many ingredients, involves too much prep, or looks like I’ll get too many pots and pans dirty, my first thought is to figure out how I can make it simpler. This lemon curd is the perfect example of what I call indolent innovation. Most recipes involve creaming butter in a mixer and setting up a double boiler. Rather than accept the laborious status quo, I set out to simplify it. First I remembered an old trick to emulsify melted butter with liquids so you don’t have to beat it into submission with an electric mixer. Then I decided that by using a heavy bottomed pot over low heat I could do away with the double boiler. Et voilà! One-pot lemon curd in about twelve minutes. But just because we’re skimping on labor doesn’t mean we’re skimping on quality. This lemon curd is just as smile-inducingly delicious as the more laborious version. The sweet and floral aroma of the Meyer lemons is in full force thanks to the liberal addition of lemon zest, and yet by straining the zest out before making the curd, you don’t end up with papery bits of zest in every bite. The resulting lemon curd is satiny smooth with a glossy yellow sheen usually reserved for pricy Italian sports cars. While Meyer lemons work best, I know they can be tough to find in some areas, so you can come up with something close by mixing two parts lemon juice with one part mandarin orange juice, same with the zest. Drop the whole stick of butter into a heavy bottomed saucepan over low heat and let it melt (the pan should be just warm enough to melt the butter). Once it's mostly melted turn off the heat. In a medium bowl, add the sugar, lemon zest, lemon juice, and egg whites. Use an egg beater or whisk to thoroughly combine the ingredients. 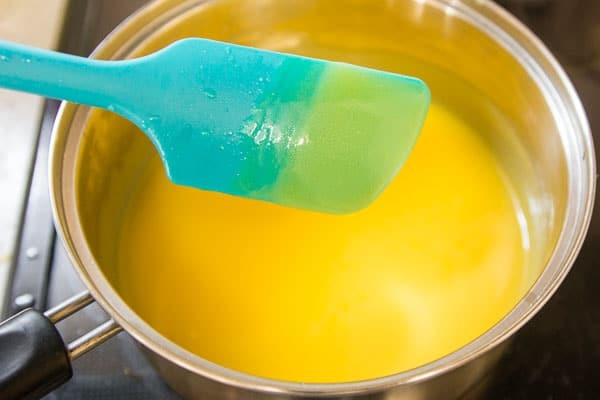 Once the butter has come down to a lukewarm temperature, add the egg yolks and whisk the butter and egg yolks together until the mixture has emulsified and is uniform in color. Use a fine mesh sieve to strain the lemon juice mixture into the butter mixture, pressing on the solids to extract the flavor from the lemon zest. Stir to combine, then turn the stove on to low heat. Heat the mixture continuously stirring with a silicone spatula to keep the curd from scorching to the bottom of the pot. The curd is done when it's reached the consistency of gravy and coats the spatula. It will be about 175 degrees F (80 C). Chill the pot in a cold water bath, the curd should get thicker as it chills. Transfer the lemon curd to an airtight container. The lemon curd will last for 2 weeks in the fridge. This is the way that most pastry chefs make it…the ‘one pot’ method is easier if you’ve got a long day of prep. And should it strike you, next time stir in a little softened butter to the cooled, but still warm curd. This will add more lovely butter richness without mad mixing. it looks so good! I love its vibrant color. Less pans to wash is always a great thing!! Lala, glad to know the technique is sound. Patricia, I was actually surprised at how intense the color was too. I think most of the color is due to the jidori eggs that I use. They have a brown shell with deep orangey yellow yolk. I think they are from regular chickens, but it has to do with what they are fed. Deborah, thanks for the comment. I hate doing dishes, so I’m always looking for ways to cut back on the # of things to wash.
Wow! This looks amazing, and I have three meyer lemons sitting in my bowl waiting to be used. Do you have any idea how long this lasts, if I don’t can it? Thanks Dana, I’d suggest using in within 2 weeks. It’s got a lot of sugar and acid, so it should last a long time in theory, but I’ve found that it starts separating after 2 weeks in the fridge. I’m actually going to post a recipe for Lemon Icebox Cake which uses about 2 cups of lemon curd tonight which should help you use it up. Diva, I’ve been known to cheat on occasion as well, but now I have no excuse to cheat anymore:-) BTW your “proper” English custard recipe sounds awesome! The yellow in your curd is amazing! I’m all for less pans and fewer dishes. Great job. That is such gorgeous meyer lemon curd. I used meyer lemons when I made my lemon meringue pie and also to make meyer lemon hamantaschen! Great photos. Here’s a recipe I just posted for Meyer Lemon Icebox Cake that uses this lemon curd. Mmmm, this looks so fantastic! I will have to try it with some of our lemons! Wonderful simplification of an old-fashioned recipe that is dying because it was too complicated. My daughter could make it in her sparsely equipped kitchen!For people outside California, you can approximate the flavor of Meyer lemons by using 1/4 orange juice, 3/4 regular lemon juice. Mandarin orange juice would be best, if they are in season. The OJ cuts the acidity and adds sweetness that is characteristic of Meyer lemons. I know nothing that can replace the aroma of the Meyer lemon peel, unfortunately. Californina-Schmalifornia! I live in Nebraska and just bought Meyer lemons at Wal-Mart, of all places. I think this recipe will be my first attempt at using them. I just bought Meyer lemons at Costco in September…in Seattle. I’m moving up! I’ve got 2 huge colanders full of tart, thick skinned Ponderosa lemons from my backyard tree & thought I’d tackle lemon curd for the 1st time. How much more sugar do you guesstimate I should add? I just found this recipe this morning and I just got done making it. This is AWESOME! The sweet/tart balance is great. My dad’s meyer lemon tree is loaded every year and I have a ton right now. Can you jar this using the water process and if so, do you know the shelf life? I would love to make a huge batch. Thanks for this great recipe. I still have Meyer lemons left in the fridge. This will be my project today. Thanks for the recipe! You are COMPLETELY awesome!!! Thank you for this gorgeous, I know delicious, and beautifully simplified recipe. I think the reason everyone loves your recipes is because a lot of readers are the same way when choosing what to cook: too many ingredients, too many laborious steps, and we’ve moved on to make ourselves a grilled cheese instead! It’s so delicious. I made three batches total and gave away to three families. They all loved it too! Thanks Marc! Mine never got to 170 on my thermometer! Problem must have been thermometer because curd was very thick but very good. Next time I’ll just eyeball! I make curd, too. this is a good method. But one of the reasons I make my own is because I like the zest, so i don’t strain it out. thanks for another good one. I started looking over your site and saw British, so I had to check out the recipes, as I amCanadian, but grew up on a lot of British food, and nose to tail, which is just coming into it’s own here in the US.